In practice, the pragmatic experience of the INSPIRE Annex I data specs development process showed that some of these steps are more important than others (e.g. the gap analysis may not be that useful in its own right, but might be implicitly performed as part of the data spec development). A report is being prepared on the experience of applying it, and will inform the Annex II/III work (which includes meteorology/atmosheric conditions). The second step is the identification of spatial object types - these are informatuion classes defined by the General Feature Model defined by ISO 19109. 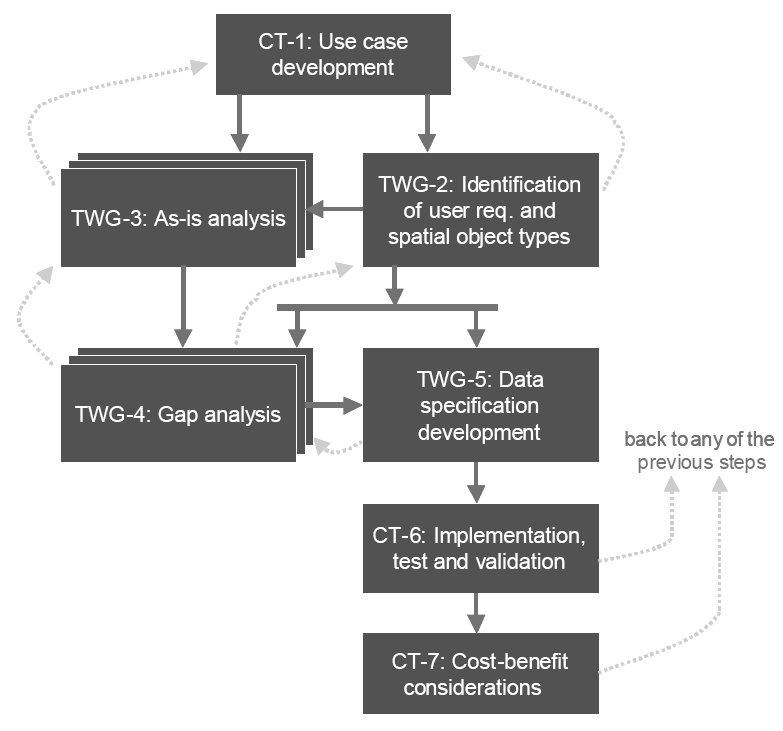 The ISO TC211 framework adopts this as the core of the data modelling framework. In essence it is an object-based modelling framework - 'spatial objects' aka 'feature types' are defined by the properties (attributes, associations, operations, generalisation). The output should be a 'first-cut' data specification. One approach (discussed by the INSPIRE methodology) is the 'nouns method': "...consider the “nouns” representing real-world phenomena in user requirements and use case description as candidates for spatial object types. After eliminating duplicates and synonyms as well as nouns that describe concepts that are not spatial object types, the remaining list of nouns can be used as an initial list of spatial object types. By analysing the user requirements and the use case descriptions in more detail, the properties (i.e. attributes and relationships with other types) as well as the constraints will be specified for the individual spatial object types." See also the Spatial Object Types derived from Use Cases.